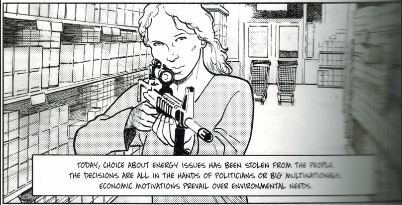 A top scientist of the Intergovernmental Panel on Climate Change, Dr Jean Jouzel, is lauding a comic publication which has the heroine gunning down three Santa Clauses in a supermarket with a military assault rifle. The realistically-drawn massacre in Climate Changed by Philippe Squarzoni (Abrams, New York 2014) is meant to symbolise the need to reduce consumerism and CO2 emissions. The book was written a year before the Nairobi Westgate shopping mall massacre in September, 2013, in which gunmen killed or wounded 240 people in the name of Islam. But the fictional massacre in the cause of reducing CO2 emissions is retained in this year’s English translation. The book, 480 pages and 1.2kg, is in the ‘graphic novel’ genre, now a serious literary form. The book won the Jury Prize at the Lyon Graphic Novel Festival in 2012. (A graphic novel, Maus, by New Yorker cartoonist Art Spigelman, won a Pulitzer in 1992). In the massacre sequence, Camille, the beautiful partner of the comic’s hero, Squarzoni himself, arrives at the “Nuclear Power Christmas Market” with what looks like a Belgian FN assault rifle slung over her shoulder. The next frame (below) shows her in the supermarket aisle amid shopping trolleys, lifting the sights to her face. Next frames, she opens fire and the Santas scream in death agonies as bullets rip into their bodies, with blood spattering. She continues firing as they start collapsing to the ground, while a stream of ejected shellcases tumble in the foreground and Cokes and Christmas parcels fly in the air. One Santa lifts his right hand as if to shield himself. Their couple’s massacre is not followed by any repercussions as the book goes on to lament the Copenhagen summit failure and excoriate “climate deniers”, who are drawn as dung beetles pushing a ball of excreta with their hind legs. A vice-chair of the IPCC’s prestigious Working Group 1 (“The Physical Science Basis”) since 2008.
Review editor, sea level chapter, 5th report. Bureau member, WG1, 4th report, 2007. A drafting author, Summary for Policy-Makers, WG1 4th report. Review editor, Paleoclimate chapter, 4th report. French expert delegate to the IPCC 2nd and 3rd reports. 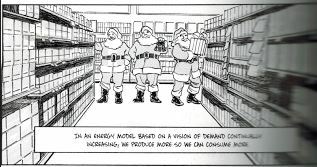 Earlier, the book’s Santa figures personify fossil-fuel use and smoke British American Tobacco cigarettes. Author Squarzoni damns sceptics as “relying on scientists who worked for the tobacco industry in the 1980s to put the science in doubt.” This theme is similarly promoted by Naomi Oreskes in her 2010 book Merchants of Doubt, now being made into a Hollywood film by Sony as something of a sequel to Al Gore’s Inconvenient Truth. I googled for IPCC climate scientists who have taken benefits from Big Tobacco. 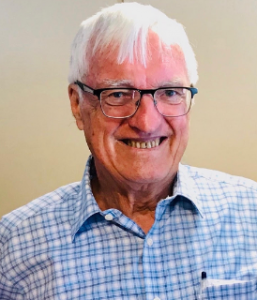 Who should turn up after five minutes but Squarzoni’s guru, Jean Jouzel himself, a recipient of a 1992 climatology prize from the Philip Morris tobacco corporation. It gets better, or worse. Squarzoni’s second-ranked advisory source is Herve Le Treut, a coordinating lead author in the 5th IPCC report. It’s taxing my schoolboy French, but under his “Prix et distinctions”, one notices, “Prix Philip Morris (1992)”. Merde, alors! Even if not identical, the Philip Morris Prizes that went to Jouzel and Le Treut clearly had a family connection to the US$100,000 Philip Morris Prizes offered in the German context. “The prize was awarded to the IPCC as an organization, and not to any individual associated with the IPCC. Thus it is incorrect to refer to any IPCC official, or scientist who worked on IPCC reports, as a Nobel laureate or Nobel Prize winner.” Pulp the book, publisher. The book contains almost 100 pages of talking-head advice from these impartial sources. Unusually for a comic, the book has a comprehensive index so that its, ahem, “science” can be easily looked up, e.g. “ice melting, acceleration of, 113, 200-203”. Under “climate change, denial of, 414-19” we discover that the Melting-Himalaya-Glaciers howler in IPCC 2007 was “the only [error] in the 3000 page report” (the truth: nine errors on that single page alone!) and that it came from a mere typo, the year “2035” for the glaciers all to melt, instead of “2350”. IPCC chief Pachauri and UN boss Ban Ki-Moon hardly called in the auditors (the InterAcademy Council) on the basis of one typo in its 3000-page report. This reality was this: The IPCC took the year 2035 correctly, but unwisely, from a popular Indian science magazine which had done the inverting of 2350 to 2035, and invented and garbled its own material. The IPCC also pretended its source was a WWF report (also garbled) and not the magazine. The IPPC page and its genesis were a mockery of science and scientific rigor. We also discover that Climategate’s famous ‘trick’ email of Phil Jones was just a method of splicing proxy and real temperature data “to make the results more accurate”. In fact, the infampous ‘trick’s’ purpose was to conceal that the proxy series was worthless. Climategate, Squarzoni concludes, was a smear campaign, “just a series of trumped-up scandals, slander and false accusations.” He scoffs at a supposed internet myth that global warming stopped in 1998, and says it arose by comparing a hot year 1998 with a cool one in 2008. (The IPCC people now acknowledge the 15-18 year halt and are arguing about what’s caused it). Among these 480 pages one finds every example of green zealot mythology. I’ll cite just one: the magical ‘climate refugees’. The index helpfully takes one to page 239, where it is stated that 250 million people could be victims of coastal flooding and 60 million could migrate from arid zones by 2020 (hey, we’re nearly there!). The cartoon frame shows a line of climate refugees trudging forward with bundles on their backs. A boatload of people departs from a tropical island: “From the Maldives to Kiribati to the Carteret Islands, people are already fleeing the rising sea level” [no they’re not, Maldives is building long-term tourist infrastructure]. “It is estimated that there are already 25 to 50 million eco-refugees fleeing from drought, hurricanes [huh? ], floods…and their migration is accelerating,” the comic insists. The frame shows an Arab-looking climate refugee sheltering under an umbrella from global warming. What seems like 150 pages of frames are authorial self-indulgence, showing Squarzoni himself agonizing over his personal task to save the planet. He gets offered a trip to Laos for an artist’s residency, but this will add to jet-trail pollution. After soul-tearing deliberation across many pages, he rejects the trip. The epiphany of Saint Squarzoni is marred by his incidental jet-setting here and there, including sight-seeing to New York. Being the product of French intellectuals, perhaps the book’s conclusion — that Western democracies must be transformed into a Greens’ playground — is no surprise. The French, it must be remembered, also regard Jerry Lewis as a comedic genius.. In technical skill, Squarzoni’s illustrations are first-rate, drawing on cinematic and advertising styles while avoiding formulaic Manga-style visual cliches. Publisher Abrams — “The art of books since 1949” — meant well. Its blurb says of the book: “This groundbreaking work provides a realistic, balanced view of the magnitude of the crisis that An Inconvenient Truth only touched on.” It adds, “Climate Changed is printed on FSC-certified paper from responsibly-managed, environmentally-sound sources.” But Abrams could hardly say no Santas were hurt in production of the book. UPDATE (it gets worse): Climate Changed New York publisher Abrams has issued a “Teacher’s Guide to Climate Changed” for 15-18 year olds. It was written in June, 2014, by Peter Gutierrez, curriculum developer and graphic novels expert for the US National Council of Teachers of English. “Philippe Squarzoni’s rigorous presentation of the relevant science and thoughtful reflection on the implications for policy, both public and personal, allow teachers to integrate economic, political, and individual responses to the realities of climate change that students will experience in their lifetime. A few of the questions in the teacher’s guide are reasonable, e.g.